Home Horse Care Horse Health What’s your horse’s colic risk? What’s your horse’s colic risk? After declaring 2013 the ‘Year of Colic Prevention,’ Equine Guelph has announced the release of its latest online health care tool – the Colic Risk Rater. This free, customized tool is designed for the individual horseperson to rate his/her horse’s risk of colic. The Colic Risk Rater assesses and calculates colic risk while providing useful feedback on management practices through a series of questions in 10 categories, requiring less than 10 minutes to complete. The goal of the Colic Risk Rater tool is to provide horse owners a simple way to determine if their horse is at a high risk for colic, given the horse’s personal scenario. After each question, the risk rater dial will fluctuate back or forth, revealing the constantly changing risk – and in the end, providing an overall colic risk rating calculation for each horse. Historically, colic became the horse’s arch nemesis thousands of years ago when humans started taking horses out of their natural environment. The use and management of modern horses are a huge departure from their wild counterparts, placing them at a higher risk of colic. 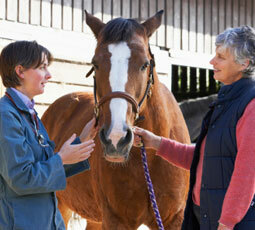 Thus, horse owners can play a major role in reducing colic risk through management. Owners must be aware of the risk factors, especially the ones we can manage such as feeding, housing, parasite control and stress. The Colic Risk Rater is one more crucial tool in the horse caregiver’s arsenal, designed to identify the risk factors and provide prevention tips, aiming to minimize needless pain and suffering of our equine companion. Given that colic is the number one killer of horses (other than old age), the ten minute investment in this free tool is invaluable. In addition to funding from Standardbred Canada, investment in this project has been provided by Agriculture and Agri-Food Canada through the Canadian Agricultural Adaptation Program (CAAP). In Ontario, the Agricultural Adaptation Council delivers this program. Partners include: Central Ontario Standardbred Association, Horsemen’s Benevolent and Protective Society of Ontario, Ontario Association of Equine Practitioners, Ontario Equestrian Federation, Ontario Harness Horse Association and the Ontario Veterinary College. To check out the Colic Risk Rater or to find out more about Equine Guelph’s Colic Prevention Programs including the upcoming fall eWorkshop, scheduled for September 9-22, visit EquineGuelph.ca. I’ve got to check this out!